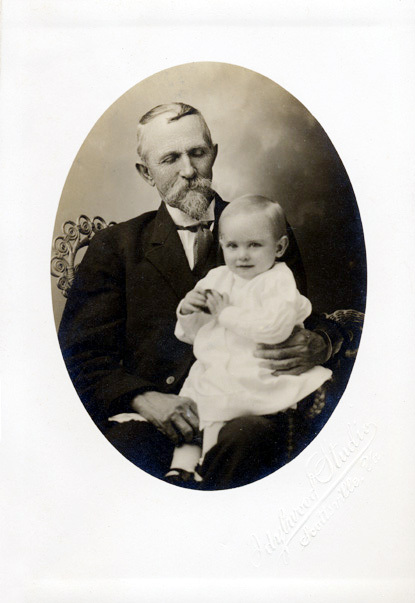 Comments: Waller E. Mallory holds his grandson for this photo taken at Idylwood Studio. Waller lived at Valmont and served as farm overseer for David H. Pitts, Valmont's owner. Waller was born on 20 March 1851 in Albemarle County, VA, and he was the son of William Andrew Mallory and Callie (Harris) Mallory. Waller married Mary E. Tyler on February 22, 1877, in Albemarle County, and they were the parents of three children: Nellie B. (b. 1882); Ovander W. (b. 1889),and Mary M. (1891). Waller passed away on 14 January 1937 in Scottsville and is buried at the Scottsville Cemetery.